Nestled in the Hackescher Markt and located in one of Berlin’s many hotspots, the Mitte area, we hurried to the Anne Frank Museum to experience its current exhibit, “Anne Frank: Here and Today.” Growing up, I had read The Diary of Anne Frank, and had taken a certain fascination with her, so I was eager to see what the museum had to offer. Earlier this week, we read “Site of Remembrance? 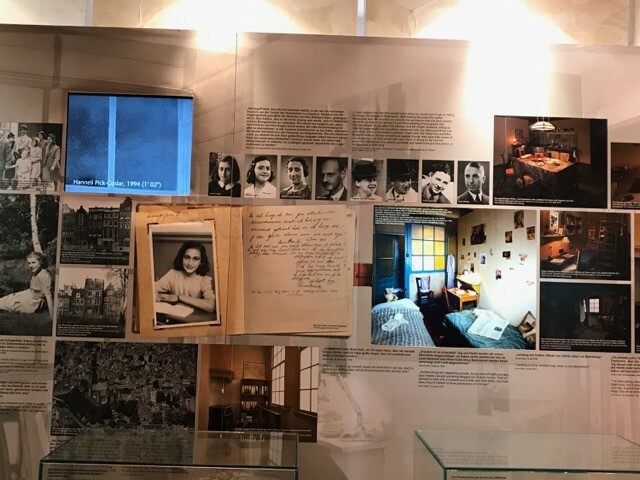 Jewish Museums in Contemporary Germany” by Sabine Offe, which gave me a new critical lens to view the Anne Frank museum as an institution as well as a physical site and how the contemporary museum contributes to the collective memory and the collective guilt of the Holocaust. 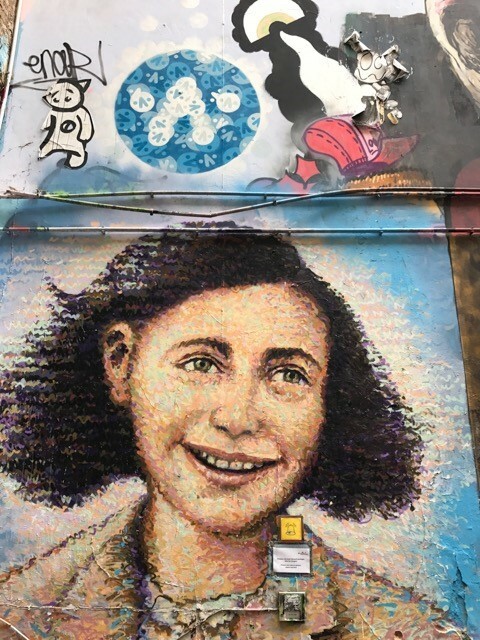 I came into this tour prepared to learn more about Anne Frank while also using a critical lens to see how the museum functions as a Jewish museum in contemporary Germany. Before unpacking the museum content, I would like to share, briefly, what we learned about Anne Frank. Anne Frank, born June 12 1929, is famously known for her diary that surfaced after her years of hiding from Nazis and has since been translated in over 67 languages. 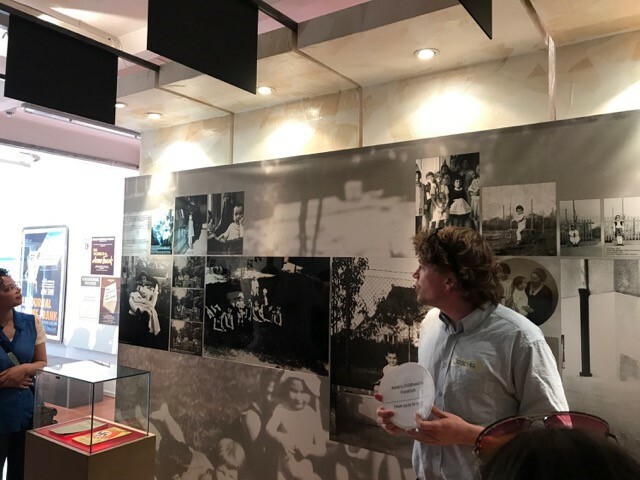 The museum focuses on Anne’s life while also providing the history of Holocaust, which our guide, Joscha Jelitzki, described in detail, as well. Born in Frankfurt, Anne grew up with her parents Edith and Otto Frank and sister Margot. The family was constantly having to assimilate to German culture while still remaining Jewish. Jelitzki noted that German Jewry in Anne’s early life was focused more on “being German” rather than “being Jewish.” More specifically, he stated, “Becoming German often meant leaving behind Judiasm.” As Hitler came in to power and the Jewish identity became more and more marginalized and controlled, Anne and her family moved to Amsterdam in 1933 where her young life was molded and assimilated yet again to the Dutch culture and language. After Germany invaded the Netherlands in 1940, Anne and her family, along with four other close friends seeking safety from the Nazi’s, went into hiding from 1942-1944 until they were eventually reported to the police and taken away. Anne had always felt what I would describe as misunderstood, using a diary given as a gift to her as an outlet to express herself and her feelings. Her diary quickly became her best friend. During her time in hiding, Anne figured that her diary could serve as a historical artifact in the future and infused her passion for writing into her diary by even editing and revising it while simultaneously continuing to fill its pages for what would eventually reach millions of readers all over the world. After being captured and arrested by the Nazis, the Frank family was taken to a local camp in Amsterdam before eventually being transferred to Auschwitz, a concentration camp in Germany, where they were separated. Anne and Margot were then taken to another camp called Bergen-Belsen, where Anne’s young life ended in 1945 just a few weeks before Bergen-Belsen was liberated by the Allies. While I was looking, listening, and reading the old photos, artifacts, and explanations, another article we read earlier this week about reflections from women of the Holocaust came to mind. In “Troubling Categories I Can’t Think Without: Reflections on Women in the Holocaust,” R. Ruth Linden uses her vast knowledge and experience with women of the Holocaust to bear caution to her readers and argue that the language used to describe or recount women of the Holocaust’s experiences must be purposeful and unique to the survivor itself. Anne’s story demonstrates that every survivor has a different story, and we must not generalize or compare her story with others, because when doing so we lose meaning and the significance of the story and its uniqueness. Along these lines, I am curious how Anne Frank’s story, a famous one, is used to understand and learn about the Holocaust. How does it shape the reader’s ideas of the Holocaust? How did it affect the lives of the people, both Jewish and non-Jewish at the time? Her story is important, but we also must remember that it does not serve as a reflection for everybody who was a victim of the Holocaust. As Offe argues, Jewish museums are “an effort to gain access to a different memory of Jews and non-Jews in Germany,” meaning that while used as crucial sites of remembrance, Jewish museums are also places of collective memory and guilt. 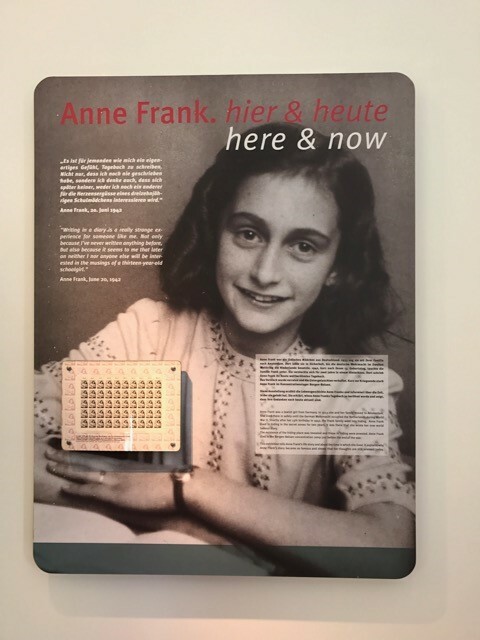 The Anne Frank Museum is geared towards educating younger local students, but is also visited by other adults, tourists, and students and therefore is, in my opinion, more of an educational experience rather than being completely focused on remembering both Anne Frank and the Holocaust. This made me think: If this museum is being used for young educational purposes, how do the depictions and explanations contribute to both the collective memory and collective guilt surrounding the Holocaust now? How is the information subjectively transposed into the minds of its visitors? Joscha explained that often most students come with the questions: How did Hitler gain so much power? Why did Germany become to anti-Jewish? Questions and answers that may be asked and found in the museum focus on the story of the Holocaust, Hitler, and of course Anne Frank; however, what I find interesting it that it provides little information on what it meant to be Jewish during that time and what it means now as the assimilation and marginalized status of Jewish Germans continues today. I believe that there is a way to use the past to understand and show acceptance in the future. The critical lens I took away from Offe’s article makes me question the use of Jewish museums in contemporary Germany as tools to express collective guilt and memory rather than understanding and giving space to Jewish Germans today. Currently, the exhibit is one that compares teens of today with Anne Frank. The exhibit is controversial in that it attempts to compare narratives, which may be detrimental to the importance and personal space of each narrative. This runs the risk of erasing value and meaning for both parties. While it can be somewhat convincing to the younger audiences that attend the museum, it was mostly not convincing to the FemGeniuses. During an activity, we divided into small groups and analyzed different aspects of the exhibit looking to answer questions presented by Joscha, which included: Who is represented? Who is not? What are the inequalities you observe? What is the design like? What is convincing? What is not? Shortly after, we presented and concluded that while the exhibit might seem like a good way to help put things into perspective, it sometimes traffics in racist undertones and problematic comparisons. Joscha, a independently contracted guide for the museum, even agreed. What does this say about the attention and collective memory that is being presented in Jewish museums in Germany today? Furthermore, this has both Heidi, Dana, and I wondering and looking to further explore the way in which history is presented and infused in German schools (or even other countries’ curricula). Just like Anne during her time of assimilation in both German and Dutch societies, young people today are easily “moldable,” and must be presented with history without perpetuating imperialism, racism, sexism, colonialism, etc. that so often lead to the rigidity of thought. I would like to thank Joscha and the Anne Frank Museum for having us and providing us with a rich dose history, while also providing a critical analysis of the curation of museums exhibits and how they impact its visitors. Liza Bering is a sophomore at Colorado College hailing from Des Moines, Iowa. She is planning on majoring in Geology and minoring in Middle Eastern Studies and Feminist and Gender Studies. She plans on combining the three different disciplines in way that with impact others on more than just a shallow surface level. 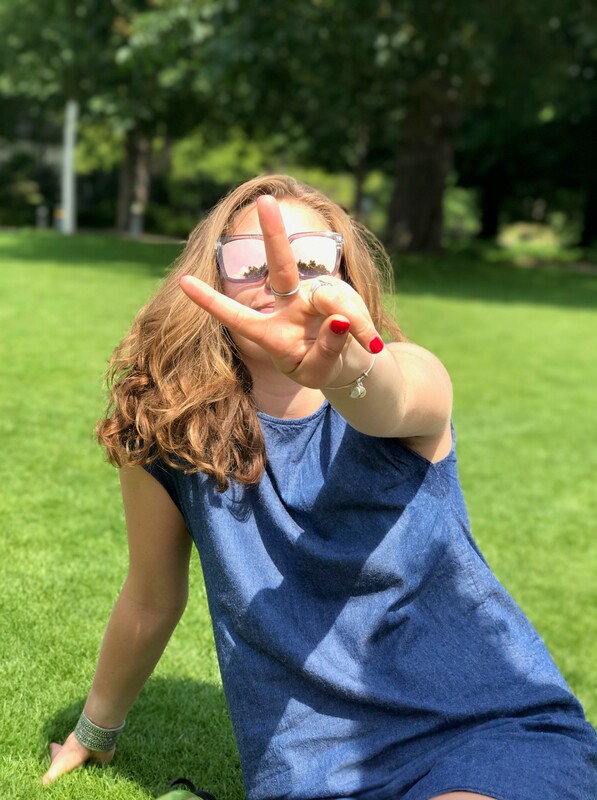 When she isn’t studying (or touring Berlin with her fellow FemGenuises) you may find her checking out street art, walking around Berlin’s beautiful city parks, or getting lost on the subway.